Nyack Underground – How OLD Are Those Pipes? Anyone living in the area of North Broadway, or having reason to be there, will have noticed the roadbed torn up as utility work goes on. 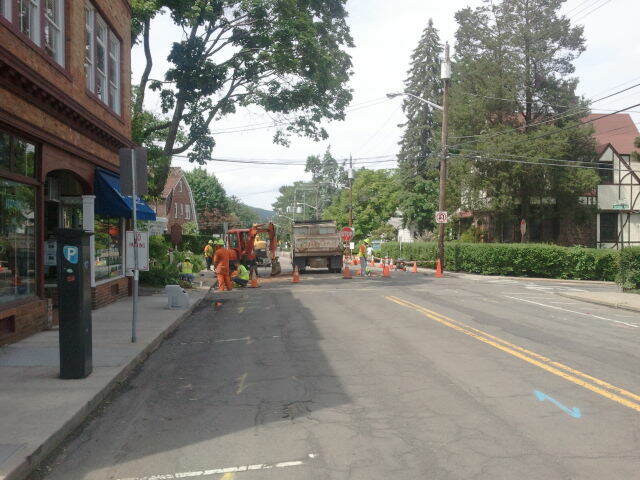 In an ongoing project, Orange & Rockland Utilities has been laying new modern high-pressure gas main lines alongside the old cast-iron gas mains. That got me thinking about our Village’s infrastructure – gas, water, sewer and electric services – and their historic presence within the Village. Though I plan to tackle each of the various utilities and services, in keeping with the current underground project, I’ll start with Gas. So, just how old are those cast-iron gas mains? OLD, and I don’t mean like fifty or sixty years, I mean old. Thank goodness those cast-iron pipes were built to last, because they sure have. If you can take a look down into the trench while the workers are there (ask permission – I did!) and take a trip back in history. Right now they are passing Fourth Avenue and Broadway, which is my own corner, and those cast iron pipes are among the oldest in the Village – AND among the oldest in the country. According to the internal records of what is now Orange & Rockland Utilities, gas service for forty-one homes and business and an astonishing three street lamps began in Nyack in 1852 under the auspices of O&R’s earliest ancestor company. This early gas company incorporated as “The Nyack and Warren Gas Company” in 1859 and the first Gas Works buildings and the first mains were constructed and laid in that year. An article in the Rockland County Journal dated August 27, 1859 – during the construction process – stated that the lines would run up Main Street from near the Hudson to what is now Franklin in large six-inch mains, continuing up to what is now Midland Avenue in slightly smaller diameter mains; the large mains would run south on Piermont Avenue to the Nyack Female Institute (on what is now Mansfield Avenue in South Nyack); and up Broadway to the Baptist Church at Fifth Avenue. Additional auxiliary lines of two and three-inch diameter would extend onto the smaller cross streets like New Street, High Avenue and First through Fifth Avenues, with pipes being extended free of charge (to residents and merchants) from the street mains to the curb until the potential customer decided they wanted gas service and paid to install pipes in their home or business with their gas meter being provided to them as a courtesy. 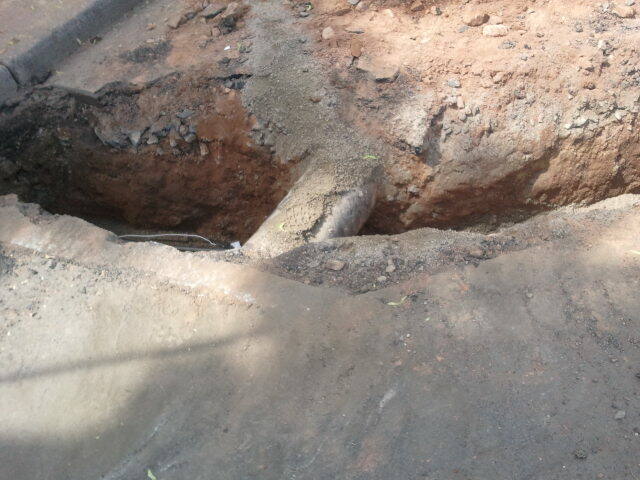 My own corner of Fourth Avenue and Broadway was part of that original roll-out of cast-iron gas mains – which means those cast-iron pipes on my corner have been there for 155 years. That’s one hundred and fifty-five YEARS… before Lincoln was elected President. Now there are some more recent vintage lines running parallel to the original cast-iron mains, but according to the workers on the site it is those more recent vintage materials which are actually the ones being replaced leaving the new high-pressure high-tech lines in tandem with the still reliable old cast irons as their safety and back-up. The laying of the original gas mains was completed by October of 1859, and by that time there were more business and residential customers, and the number of street lamps in Nyack was up to twenty-one. Interestingly, at the time most of the street lamps were owned privately by businesses or by groups of residents who wanted one for safety and convenience on the street outside their homes. Only THREE of those lamps in 1859 were owned by the Village, those being located at Broadway and First, and two between Broadway and New Street (and no, Village Hall wasn’t on that block yet, so that is NOT why!). Another article in the Rockland County Journal, written on June 16, 1860 discussed at length the new Nyack Gas Works and a tour the reporter was given of the facility. At the time, the gas for local customers was derived from coal. Coal was heated in the “retort house” until gas was released, leaving behind coke and ash. The gas was released into a “hydraolic main” (their spelling, not mine!) which directed it into a condenser where tar and ammonia were removed from the gas by utilizing the suspension properties of the water in the cooling tanks. Finally the gas reached the “purifying house” where passing through lime purifiers the remaining impurities consisting of carbonic acid and hydrogen sulfide were scrubbed from the gas. It was then piped to the twelve by thirty-six foot cylinder that stored all the gas the six hundred and twenty-four gas burners and twenty-one street lamps Nyack of 1860 required for a 24 hour period. The reporter for the Rockland County Journal was actually even more specific on the process – if you’d like to know more about the process, I highly recommend the article which can be found in the HRVH Historical Newspaper Archives available on-line. It is very interesting to note that the self-same Mr. Voorhis would charter the “Nyack Water Works Company” in early 1873, and become president of THAT utility supplier as well. I’ll discuss when I follow-up this post with a discussion of the Nyack Water Company. The Nyack Gas Works re-incorporated as the “Nyack Gas and Light Fuel Company”, still under the auspices of Mr. Voorhis. In 1899, the company found itself with a local rival. A gentleman from Upper Nyack, one S.R. Bradley, invented a product called “Orangeburg Pipe” named after the location of the factory in which he produced the product – an industry staple in the Electrical Field until well into the 20th Century. His holdings in Orangeburg and Blauvelt needed power – both gas and new-fangled electric – and so he formed the “Rockland Light and Power Company” in 1899 becoming its president. Mr. Bradley would go on to purchase the Nyack Gas and Light Fuel Company in 1905, and merge it into Rockland Light and Power. Bradley’s “Orangeburg Pipe” (a fully recycled product a century ahead of its time) would become legendary and he is remembered by the names of the Bradley Industrial Park and Bradley Parkway, the road that runs over Clausland Mountain from Blauvelt to Nyack. (Mr. Bradley’s daughter, Augusta Chapman Bradley was a lifelong Upper Nyack resident and International Tennis Star with a 30 year professional career winning 60 major tournaments who helped found the National Tennis Association – a natural for the Rockland County Sports Hall of Fame, her career is the earliest time-wise of all the honorees. Read about her in my September 2011 article “100 Years Ago This Month: Nyack’s National Tennis Tournament” http://bit.ly/1mcZP0a). Nearby, the “Orange Utility Company” was founded in 1905, which was then acquired by Rockland Light and Power in 1924 creating the subsidiary “Orange and Rockland Electric Company”. Rockland Light and Power re-incorporated in 1926, and pioneered the delivery of clean natural gas in 1935. In 1958, Rockland Light and Power received permission from the Federal Public Service Commission to consolidate its subsidiary Orange and Rockland Electric. The fully merged company was renamed “Orange and Rockland Utilities, Inc.” It would be purchased in 1999 by Consolidated Edison of New York City for $790 million dollars. According to the deal records of Lehman Brothers in the Harvard Business Library, after the acquisition analysts claimed this was a substantial and possibly illegal undervaluation of Orange and Rockland. So there’s a snapshot of the history of gas service in Nyack – one of the earliest in the country and despite some bumps, still steadily serving the community that nurtured its’ birth. As a great-great-great granddaughter of William Voorhis, I found this article informative and inspirational. Thank you.